The average size of new private flats outside the central area will have to be at least 85 sq m, a regulatory change that will cut the number of units allowed in a project - something that developers say would sound the death knell for en bloc deals and moderate condo and land prices in the affected areas. The Urban Redevelopment Authority (URA) also further announced on Wednesday that nine areas in Singapore - up from four presently - will be subject to an even more stringent minimum average requirement of 100 sq m, namely Marine Parade, Joo Chiat-Mountbatten, Balestier, Telok Kurau-Jalan Eunos, Stevens-Chancery, Pasir Panjang, Kovan-How Sun, Shelford and Loyang. Under the revised guidelines, the minimum average unit size for such developments - including executive condominiums and residential components of mixed-use developments - outside the central area will go up from 70 sq m to 85 sq m from 17 January 2019, which is also the effective date for the 100 sq m threshold in the nine designated areas. This comes as the URA has observed smaller unit sizes in new private housing projects, which in turn could put pressure on local infrastructure. Goh Chin Chin, URA's group director for development control, said the revised maximum number of allowable dwelling units will help to manage potential strains on local infrastructure and safeguard the liveability of residential estates, while encouraging developers to provide a more balanced mix of unit sizes to cater to the diverse needs of homebuyers. Cushman & Wakefield head of research Christine Li described the reduction as possibly the "final nail in the coffin for the en bloc market in the outside central area", especially for the nine areas facing a more stringent control. She said the 85 sq m and 100 sq m limits reduce the number of units in a development by 18 per cent and 30 per cent respectively, curbing developers' ability to prop up profit margins by launching smaller units. The number of shoebox units entering the market will also come down in the longer term. JLL national director of research and consultancy Ong Teck Hui shared her view. He said the move will result in a lower number of units being built in a residential project as well as units generally having bigger floor areas. "This is likely to have the effect of reducing the average (psf) selling price... With an increased floor area, the psf sale price of an apartment or condominium will be lower as the developer will try to maintain an affordable absolute price for the unit." Residential land prices are expected to be also affected given the lower average psf selling prices, he added, which would moderate the trend of rising prices. Cushman's Ms Li said: "The new guidelines should not scare away all developers, but they are expected to submit cautious bids for future land tenders, which could lead to downward pressure on land prices. Nonetheless, land prices are not expected to tank as defensive bidding from developers will lend support to current price levels." CBRE's head of research (Singapore and South-east Asia), Desmond Sim, reckons that the revised guidelines on minimum average unit size shouldn't impact government land sales much, but could act as a dampener for the land acquisition market, especially given the latest wave of property cooling measures imposed in July. "It will force developers to rework their sums because the play on size will not be so beneficial to them anymore," he said. As for buyers, a developer who declined to be named said those in the market for biggish units and do not require a new property urgently may hope the downward trend for land prices would translate to more affordable end-unit psf pricing for them. "They may feel it could be worth the wait," he said. "However, those looking for smallish units may feel that the future supply of such units will shrink and therefore it may be good to buy now before the supply dwindles." 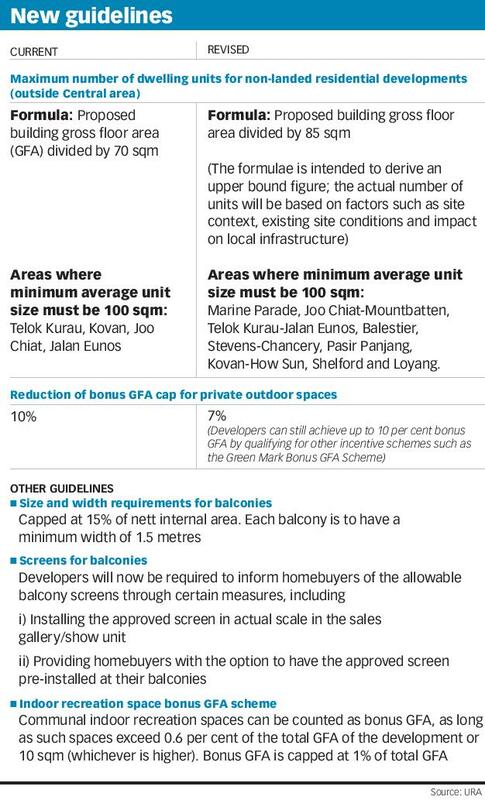 Along with the higher average flat size, the URA said that from next Jan 17, the URA will lower the 10 per cent bonus gross floor area (GFA) cap for outdoor spaces in private non-landed housing - namely, balconies, private enclosed spaces and private roof terraces - to 7 per cent. And in response to public feedback and some "excessively large balconies" in some developments today, the total balcony area for each unit will be capped at 15 per cent of the net internal area. Developers will also be required to inform homebuyers of the allowable balcony screens at the point of purchase. To encourage developers to provide residents with more indoor recreation spaces such as gyms or function rooms, the URA introduced a scheme - effective immediately - that offers bonus GFA, capped at one per cent of total GFA. URA's Ms Goh said: "The revised Bonus GFA schemes complement other Bonus GFA schemes, and encourage the industry to improve the provision of communal spaces, as well as provide homebuyers with a better mix of units with and without balconies, while ensuring that the balconies provided are more optimally sized and located."